Why does the altitude beeped out by the R-DAS on landing differ from the altitude obtained from the R-DAS PC software ? What sampling does the R-DAS use ? Can an R-DAS be used near telemetry transmitters ? How can velocity data be obtained from an R-DAS ? How can a Cd curve and motor thrust curve be derived from R-DAS accelleration data ? What data can be obtained from a standard R-DAS without any additional modules ? What frequency does the R-DAS Telemetry Module transmit at, and what is the power output of the transmitter ? With the R-DAS Telemetry Module, how is the received signal quality measured ? How does the R-DAS GPS unit handle velocity data ? What type of GPS unit is used in the R-DAS GPS ? What needs to be done to ensure the R-DAS GPS Module gets a lock ? What software is available for the R-DAS ? Is any R-DAS download or processing software available for UNIX or Linux ? What protocol does the R-DAS use for downloading data to a PC ? Is it possible for an R-DAS not to detect lift-off ? What can cause noise in the data ? What is the smallest standard airframe an R-DAS can be fitted in ? Which way should the R-DAS be orientated in a rocket ? Is it possible for an R-DAS not to fire an igniter for an ejection charge ? 1. Why does the altitude beeped out by the R-DAS on landing differ from the altitude obtained from the R-DAS PC software ? Atmospheric pressure vs. altitude is stored in a 20-entry table, and interpolation is used. Launch takes place from sea-level. The calibration value of the pressure transducer is not used in the R-DAS, only for post-processing. Because of these assumptions the beep-out altitude may be different from the actual altitude, therefore the actual achieved altitude to use should be the altitude downloaded to the R-DAS user interface. 2. What sampling does the R-DAS use ? The R-DAS uses a 10-bit sampling resolution, which results in an accuracy of about 30 feet (10 metres). 3. Can an R-DAS be used near telemetry transmitters ? The R-DAS has a multilayer screened board, which should alleviate issues with transmitting equipment, however, high power transmitters (1 Watt and greater), can cause problems. 4. How can velocity data be obtained from an R-DAS ? Velocity data can be obtained from an R-DAS by downloading the R-DAS data and running the R-DAS plot software. The R-DAS plot software enables velocity data to be grpahed immediately. The velocity is only valid up to the point where apogee is reached, so define the maximum x-range of the graph by setting the max. xrange in the box (there is no need to fill in the minimum value). The user equations can be used for all kind of analysis of different signals and unit conversions. Once you have a graph press right mouse button on the graph to print it or copy it to the clipboard. 5. How can a Cd curve and motor thrust curve be derived from R-DAS accelleration data ? The procedure for determining these parameters is to use the R-DAS plot software. The minus comes from the fact that the acceleration is negative after burnout, but we want to see positive Cd values. $3*9.81 is the acceleration converted from g's to m/s2. $7 is the velocity of the rocket. The ** is the gnuplot convention for power raising. Select 'velocity' and 'user equation 1' as graphs to plot. Now fill in the time to apogee for x-maximum and press 'plot'. That's all to get a Cd curve! Note that you can not interpret the Cd value at all times, e.g. not when the motor is burning. The Cd just after burnout should give the best estimate. It might be necessary to set y2 range to e.g. 0 to 1 to give a nice graph. For determining motor thrust a similar method can be followed (assuming constant rocket mass). 6. What data can be obtained from a standard R-DAS without any additional modules ? 7. What frequency does the R-DAS Telemetry Module transmit at, and what is the power output of the transmitter ? The R-DAS Telemetry Module transmits at a frequency of 433 MHz. 8. With the R-DAS Telemetry Module, how is the received signal quality measured ? The received signal quality is defined as percentage of packages per second that were received with CRC checksum ok. The receiver expects 10 packages (measurement data) per second. Every missing package or package with CRC checksum error is considered to be an invalid package. So 100% is 10 packages / sec, 50% is 5 valid packages per second. 9. How does the R-DAS GPS unit handle velocity data ? The GPS unit does no filtering of the velocity data. The R-DAS GPS unit stores all measurement points in the unit. However, if the rocket has not launched, only the last GPS position is stored. With experiments such as this, care needs to be taken to ensure that the unit is triggered. As long as no lift-off is detected, the pre-flight position is continuously overwritten. However, when the data is read out later via the serial port, all the data should be obtained. 10. What type of GPS unit is used in the R-DAS GPS ? A U-Blox GPS unit is used. U-Blox are based in Switzerland. 11. What needs to be done to ensure the R-DAS GPS Module gets a lock ? The R-DAS and R-DAS GPS Module need to be outside and away from buildings or obstacles that can obscure the link to GPS satellites. The R-DAS GPS Module needs to be plugged into the R-DAS, and switched on. Batteries which have been freshly charged, or have a large capacity should be used. The R-DAS GPS Module draws a considerable amount of current, and in combination with a the R-DAS itself, will drain a normal PP3 9 Volt battery relatively quickly. For peace of mind, it is worth investing in a 9.6 Volt rechargeable Ni-Cad or NiMH battery pack to ensure sufficient capacity is available. The R-DAS GPS Module Antenna needs to be orientated the correct way. 12. What software is available for the R-DAS ? 13. Is any R-DAS download or processing software available for UNIX or Linux ? Yes, work is underway to port the R-DAS software to Linux (using C and the Qt libraries), and Linux and UNIX (using Perl/Tk). A significant amount of work was carried out on the C software port to Linux by AED, with the software running under KDE. 14. What protocol does the R-DAS use for downloading data to a PC ? The R-DAS uses the RS-232 protocol for downloading data to a PC. The download cable supplied with the R-DAS, enables the R-DAS to be plugged into a standard desktop or laptop PC with an RS-232 9-way serial port, or a serial port to USB converter. If the R-DAS is to be connected to a Windows CE handheld PC or a PalmPilot PDA, then a null modem cable or adaptor needs to be fitted to the R-DAS cable, and then the null modem cable or adaptor needs to be connected to the Windows CE handheld PC or the PalmPilot. 15. Is it possible for an R-DAS not to detect lift-off ? 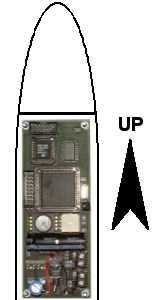 With earlier versions of the R-DAS firmware, and under certain circumstances, it is possible for an R-DAS not to detect lift-off of a rocket. The RDAS launch detection works by detecting an acceleration of 2.1 g for 0.25 seconds, therefore, if the pulse is never longer than .25 seconds the RDAS will never detect launch. This has only been found to be an issue with Hypertek hybrid rocket motors where a certain amount of pulsing of the thrust levels can occur, which can reset the detection or prevent the detection from ever being tripped, and for rockets with a very low thrust to weight ratio, where the acceleration never exceeds 2.1 g.
The issue has not been encountered in R.A.T.T.Works hybrid rocket motors. AED developed a software upgrade to the firmware that solves this issue, and the issue only affects R-DAS users using earlier firmware in their R-DAS units. A solution that completely avoids this issue, is to use the breakwire detection option on the R-DAS to detect launch. 16. What can cause noise in the data ? Noise in the R-DAS data can be caused a number of ways. Beepers can cause noise in the accelerometer data (especially if they are very loud) by causing the board to resonate. The solution to this, is a sturdy mounting of the board, which reduces resonant effects. G10 is a good sturdy mounting material, and when combined with strong stand-offs, should eliminate the problem of resonance caused by the beeper. RF data can also interfere and cause noise in the R-DAS data if the transmitter power is high enough. The solution to this is to shield avionics likely to be affected, or mount any transmitter antennae away from the R-DAS or any other avionics that could be affected. 17. What is the smallest standard airframe an R-DAS can be fitted in ? The smallest standard airframe a Compact R-DAS can be fitted in is a 38mm (1.5 inch) diameter body tube. The smallest standard airframe a Classic airframe can be fitted in is a 54mm (2 inch) diameter body tube. 18. Which way should the R-DAS be orientated in a rocket ? 19. Is it possible for an R-DAS Classic not to fire an igniter for an ejection charge ? Yes, it is possible for an R-DAS Classic not to fire an igniter for an ejection charge. If this happens with an R-DAS Classic, then ensure that jumpers are fitted to connections J1 and J2. This ensures the current to the igniters is not limited to 1 Amp.